Fluid Samplers l Vortox Air Technology, Inc. 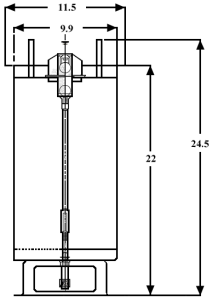 The Vortox Air Technology Liquid Sampler is a precision instrument manufactured of Stainless Steel, easy to install, use, and maintain. Liquid Samplers are primarily used to capture grab and/or composite (time weighted,continuous collection) samples. 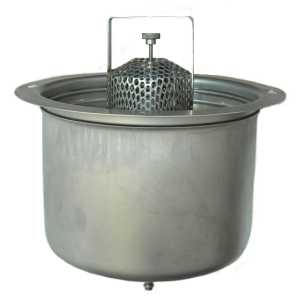 The Sampler is available in standard 316L Stainless Steel or Teflon® coated 316L Stainless Steel on the internal surfaces of the Sampler where the effluent is captured. 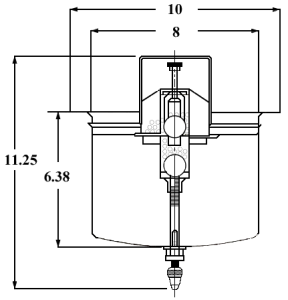 The Liquid Sampler can be suspended by Stainless Steel cables underneath existing grates with a drop box depth approximately 16″ or the Sampler has its own sump assembly and traffic rated grate for any below grade “in the ground” installation. Installation of the Liquid Sampler will vary in many cases. Actual locations of sample collection sites must be confirmed by the permitting agency. However, typical installations include: Sampler, Sump and Grate set in the ground, the Sampler suspended in the existing Sump by optional Eye Bolts and Cables (.80 gallon only), or the Sampler and Sump installed in core drilled bottom of existing Sump. For more information, see the Liquid Sampler Options and Accessories.